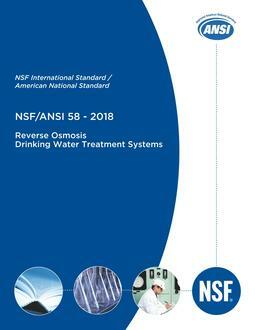 The purpose of this Standard is to establish minimum requirements for materials, design and construction, and performance of reverse osmosis (RO) drinking water treatment systems. This Standard also specifies the minimum product literature that manufacturers shall supply to authorized representatives and owners, as well as the minimum service-related obligations that manufacturers shall extend to system owners. The point-of-use RO drinking water treatment systems addressed by this Standard are designed to be used for the reduction of specific substances that may be present in drinking water (public or private) considered to be microbiologically safe and of known quality. Systems covered by this Standard are intended for reduction of total dissolved solids (TDS) and other contaminants specified herein. They may be chemical or particulate (including filterable cysts) in nature. It is recognized that a system may be effective in controlling one or more of these contaminants, but systems are not required to control all, however, TDS testing is required. Systems with manufacturer claims that include components or functions covered under other NSF or NSF/ANSI Standards or Criteria shall conform to the applicable requirements therein. Systems covered by this Standard are not intended to be used with drinking water that is microbiologically unsafe or of unknown quality without adequate disinfection before or after the system. NOTE — Systems that are compliant with NSF/ANSI 55 Class A or other standards that cover technologies to treat microbiologically unsafe water (e.g., US EPA Guide Standard and Protocol for Testing Microbiological Water Purifiers or NSF P231) are examples of demonstrating adequate disinfection before or after the system.